This monoclonal antibody binds to human TIMP-1. The antibody was tested for cross-reactivity with TIMP-2 and did not cross-react. Recombinant human TIMP1 protein (ab82104) can be used as a positive control in WB. Colon carcinoma. Our Abpromise guarantee covers the use of ab2464 in the following tested applications. IHC-P: Use at an assay dependent concentration. Perform antigen retrieval: microwave 7 min 950W or 20 min 800W in 0.01 M sodium citrate buffer pH 6.0. WB: Use at an assay dependent concentration. Immunohistochemistry (Formalin/PFA-fixed paraffin-embedded sections) - Anti-TIMP1 antibody [2A5] (ab2464)This image is courtesy of an anonymous abreview. 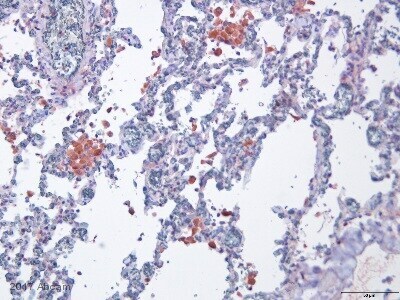 Immunohistochemistry (Formalin/PFA-fixed paraffin-embedded sections) analysis of human lung tissue sections labeling TIMP1 with undiluted ab2464. Tissue sections were fixed in formaldehyde; heat-mediated antigen retrieval was performed using a citrate buffer pH 6.0. The tissue was blocked with 3% serum for 30 minutes at 20°C, followed by incubation with Anti-TIMP1 antibody [2A5] (ab2464) for 12 hours at 20 °C in PBS. A biotin conjugate goat anti-mouse secondary antibody was used at 1/100 dilution. Publishing research using ab2464? Please let us know so that we can cite the reference in this datasheet. Thank you for your enquiry. I have contacted the source of this antibody and unfortunately the concentration has not been determined. The starting dilution for IHC should be 1:2, in addition to serial dilutions to determine the optimal concentration. I have also discovered that antigen retrieval (microwave 7 min 950W or 20 min 800W in 0.01 M sodium citrate buffer pH 6.0) should be performed. I hope this information helps, please do not hesitate to contact us if you need any more advice or information.